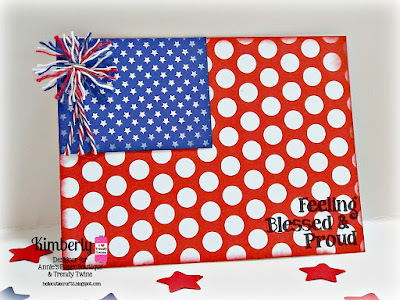 The 4th of July is just a few days away I have another fun project to share using the Large Kraft Pillow Boxes and my all time favorite Trendy Twine~the Stars and Stripes! 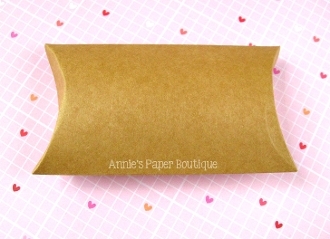 Did you know that you can emboss these Kraft Pillow Boxes??? I did this one with the stars embossing folder from Cuttlebug and it gave the pillow box such an awesome texture. 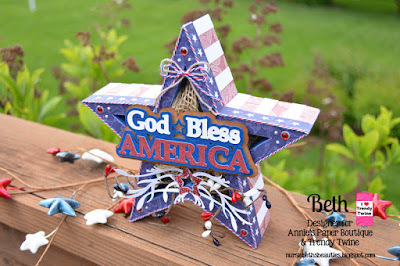 I did keep my project on the CAS side to really showcase the embossing on the box as well as show that wrapping some of the gorgeous Stars and Stripes Trendy Twine around the box and attaching a sweet tag is just the finishing touches a 3D project needs. I hope you have enjoyed my project and have a great Tuesday! It's Tammy from Creating Somewhere Under The Sun with you today! If you are headed to a friend's for the 4th and looking for a little hostess gift to take...how about some Patriotic Popcorn in a cute jar with some fabulous Stars and Stripes Trendy Twine? I think any hostess would appreciate this don't you? For my card, I started with a Real Red card base onto which I added a layer of blue and kraft patterned paper. To top that I added a star embossed layer of kraft cardstock to carry out the patriotic theme we are celebrating this month. 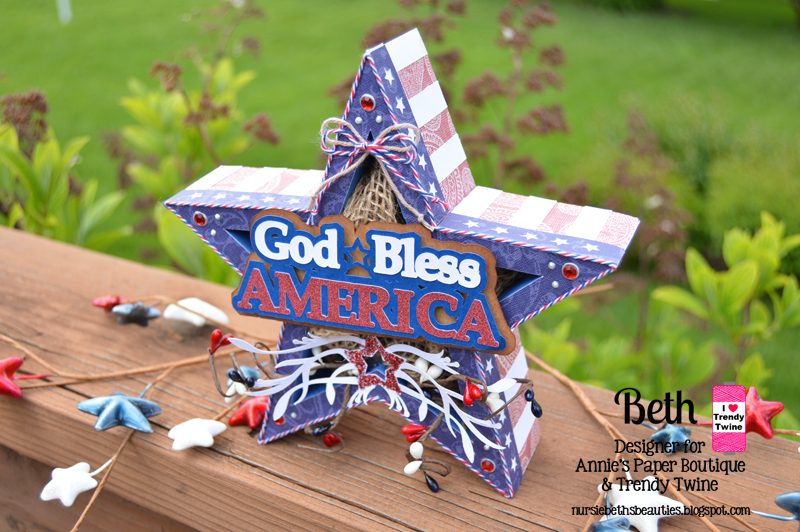 I added lots of the fabulous Stars and Stripes Trendy Twine behind a die-cut star to serve as my main focal image. I have always been a fan of Baker's Twine used this way! Just above my sentiment, I wrapped the twine around several times and tied in a bow to complete the card. I just added a little bit of the twine at the top of the lid to tie it all in and decorate the jar. The label was found on line. The popcorn is easy to make. Just melt white chocolate, add sprinkles and M & M's and toss. 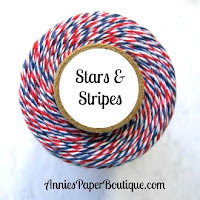 Head on over to Annie's Paper Boutique to pick up this Stars & Stripes twine for those patriotic projects. Thanks so much for stopping by and have an awesome day! 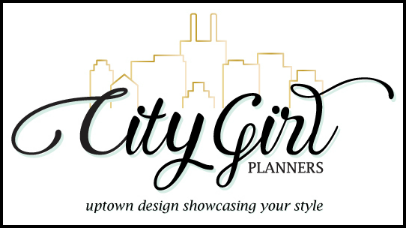 Welcome to the Trendy Twine-SVG Attic Sweet Summertime blog hop! We are so excited to have you join us today! At each stop of the hop we hope you will be inspired by the creativity of the design teams of Trendy Twine and SVG Attic. You are sure to find many wonderful projects that will be at the top of your crafting lists. You are at the very first stop in the hop, so be prepared for many wonderful projects to follow! Here are some past projects from our blog that feature SVG Attic files. To see more details on each of these projects, please click on the link above each picture and it will take you to the original blog posts. That will give us a total of 4 winners for this hop! 1. Become a follower of each blog in the hop (including this one). 2. Leave some comment love at each stop. 3. If you do both of the above, check back at the SVG Attic blog and/or the Trendy Twine blog for the winners on Wednesday, July 1st. You have until midnight Tuesday to hop! 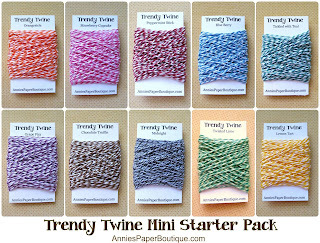 We would also love it if you would stop by the SVG Attic and Trendy Twine Facebook pages and give us a "Like"! I hope you have enjoyed this first stop on our hop! Be sure to head on over to the other stops for more summer inspiration. Comment and become a follower (each blog; including this one) to be eligible for the prizes! This is Shelly from My Paper Love sharing a fun little treat. Today I'm showcasing Stars and Stripes Trendy Twine & Red Chevron Favor bags. We celebrate the 4th down at the beach! We play all day then walk home clean up and walk back down for a huge firework show provided by our city. They light the fireworks right off ocean barges near the shore. It's pretty amazing! So I thought some cute treats were in order for the 4th of July! What's better on the 4th of July than POPCORN? I used these adorable favor bags to hold some yummy popcorn that we can all carry down to the beach! I used a die cut for the 4th of July. I wrapped the number 4 with Stars and stripes Twine. I filled the bags with yummy popcorn that I'm sure the kids and adults will love! 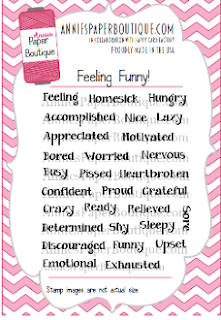 Stop by the boutique and check out all the fun goodies! Stop by the Trendy store and check out these fun items! Hello everyone! 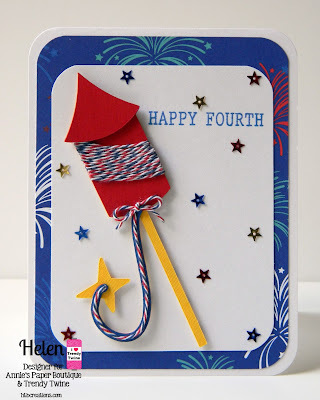 I'm Helen from HTB Creations and I have a fireworks 4th of July card to show you today. 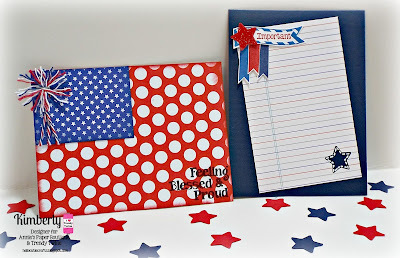 We are showcasing the fabulous Stars & Stripes Trendy Twine this month and it so one of my favorites!! I used a firecracker that I glued my Stars & Stripes Trendy Twine on the 'fuse' and they on the middle section. It was just a plain white section but this made it look so much better :) I added some fun fireworks Doodlebug paper and lots of fun star sequins. I pop dotted the top of the firework on and also pop dotted the whole firework to the card. 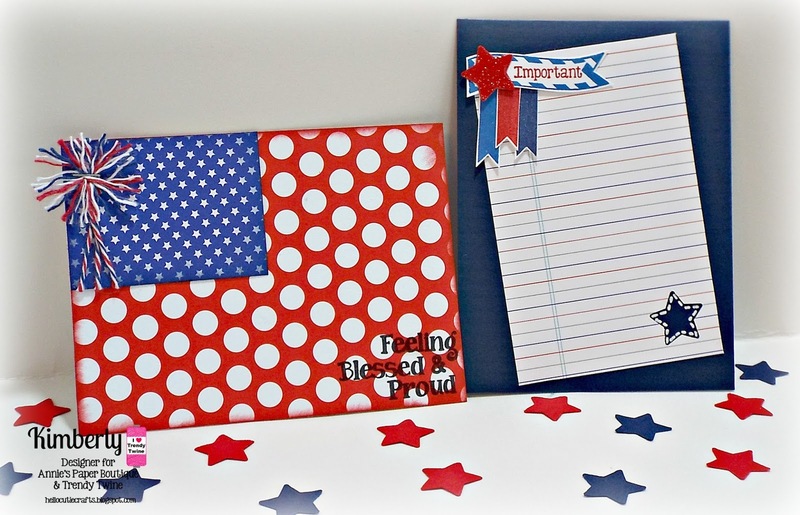 Make sure to keep checking in to see all the fun red, white, and blue projects the design team has made. For more inspiration, join the Twine It Up! Facebook group and you can share your Trendy Twine projects as well. 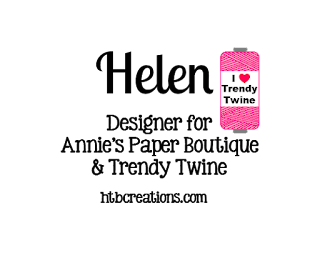 Last, but not least, head over to Annie's Paper Boutique for all your twine and packaging needs--and lots of other fun goodies too!! 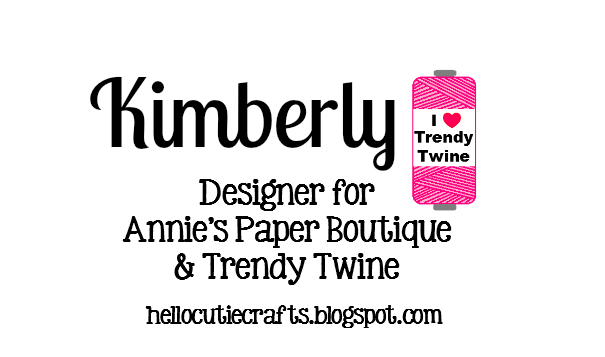 Hello fellow Trendy Twiners! It's Ann Marie from Yours TruLee! I was so honored when Lesley asked me if I wanted to do a Fathers Day post! Of course I said yes! So here I am! Today is such a special day for me. As we all celebrate our Fathers I think of the choice mine made. He chose me to be his daughter and for that I will be forever grateful! I could never repay him for the love he has given me. I'm thankful he found my mom and I. I haven't always made the best choices in life but I am thankful for this great man who stood by me no matter what :) I love you dad and hope you have a wonderful Fathers Day! As I thought about what I wanted to make I realized this was going to be more difficult then I realized lol. My dad is not into fishing, or many other "hobbies". He loves his motorcycle and is a die hard Harley Davis fan. He also loves coffee and relaxing in front of the TV. With that said I decided a card with a gift card holder would be the perfect gift for him! 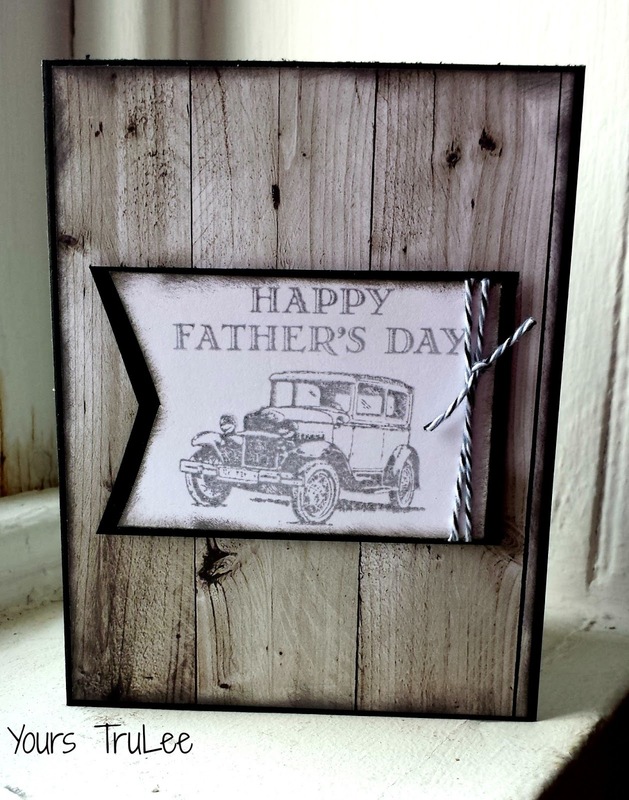 I used a simple black cardstock with some wood grain background and then a simple Fathers Day sentiment. 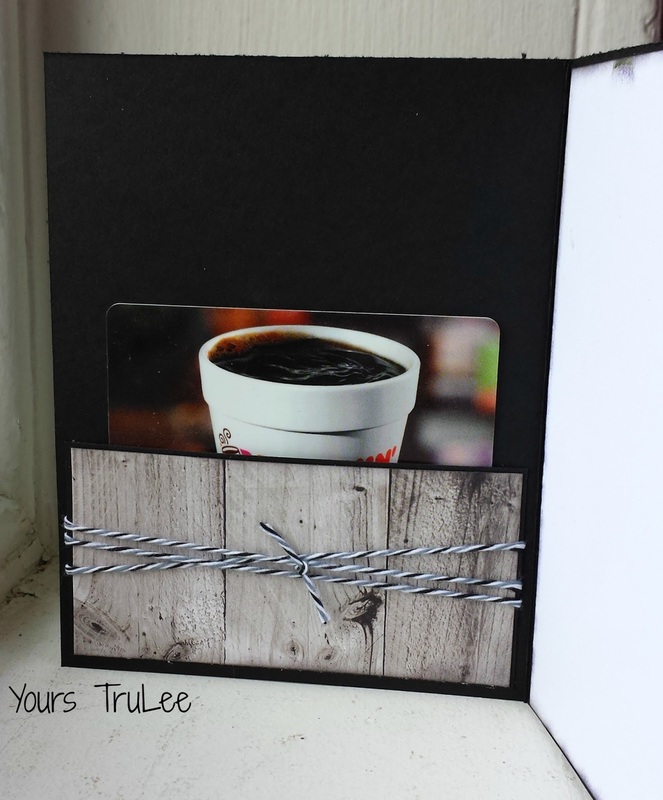 The Midnight Twine was the perfect addition to the card! Men are so simplistic that you do not need to do much to make their cards look masculine. Here is a close up of the twine! Really love this color combo! Thank you Lesley for letting me guest on the blog again! Always an honor and pleasure! Hope you all enjoy celebrating your Fathers today! Hey All!!! This is Melissa from M Miranda Creations and today is my day to share with you! I hope all of you are having a fantastic weekend!!! 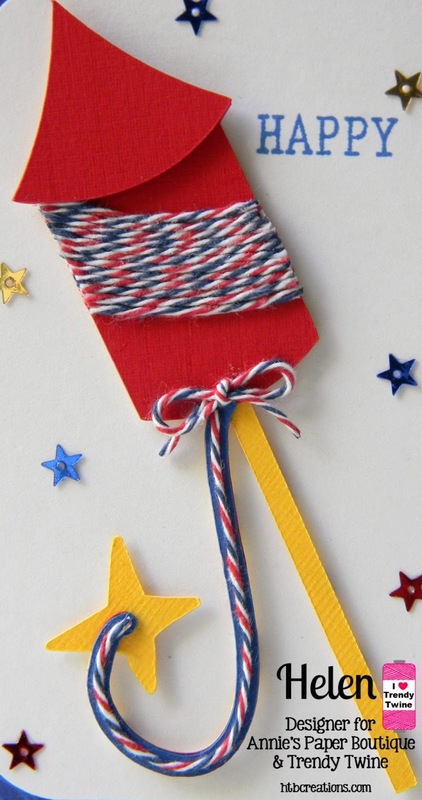 This month has been all about Stars and Stripes Trendy Twine as we prepare for the 4th of July holiday. I have a tag to share with you today. I really like how the colors just pop on this tag. But my favorite part is the twine to decorate the top. 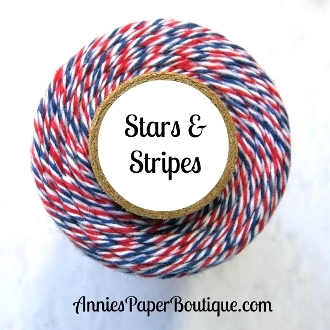 I think the Stars and Stripes twine is just a perfect twist for the upcoming holiday! Thank you for stopping in today. If you would like more details on my tag, please stop by my blog! 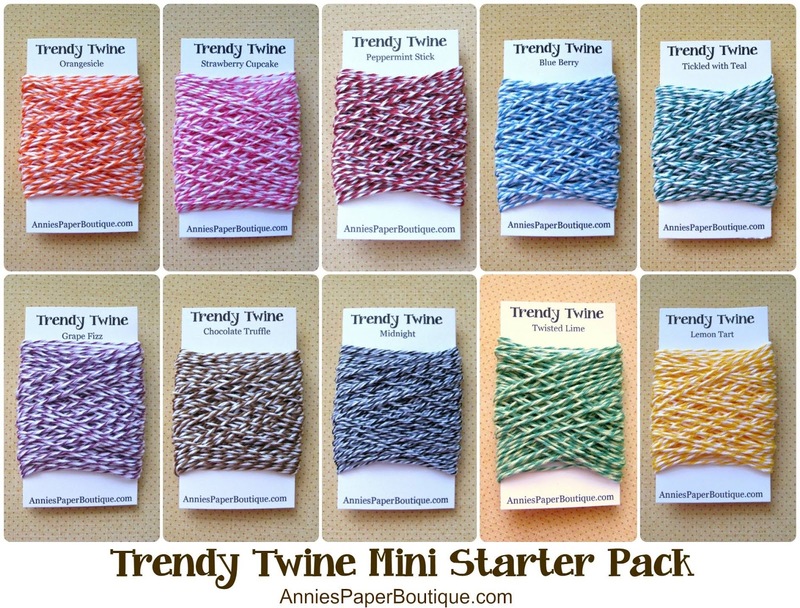 And please visit the Trendy Twine store - Annie's Paper Boutique - to pick up your Stars and Stripes Trendy Twine. It is on sale all month long. Happy Thursday Trendy Twiner Peeps! 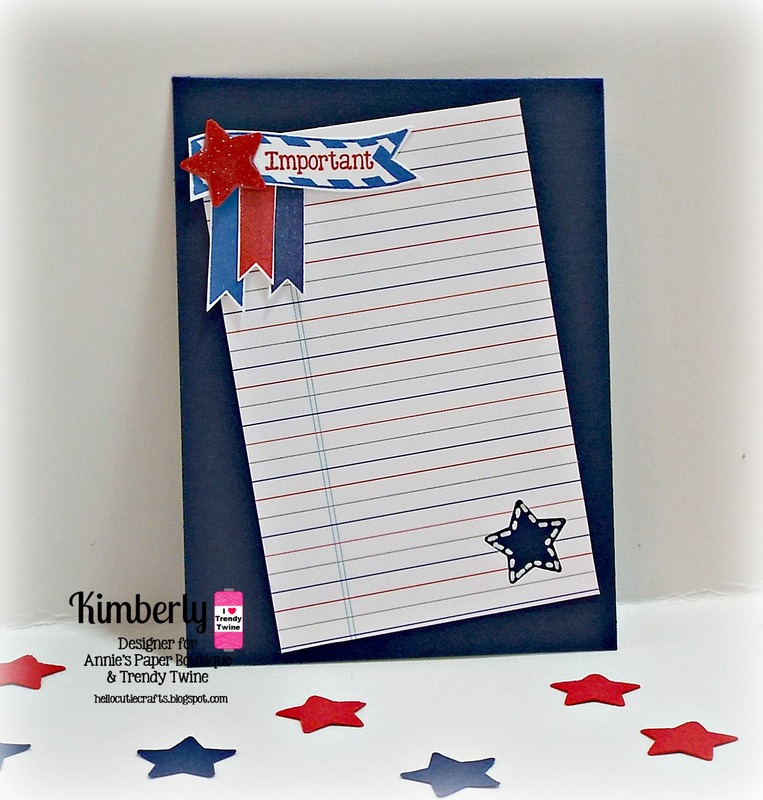 It's Tammy, and I have a masculine graduation card today using our fabulous Stars and Stripes Trendy Twine which is still on sale!!!! I started with a red card base onto which I added a layer of white cardstock. Using some patterned paper from my stash, I die-cut a banner adding to the middle left side of the card front. I added a strip of red polka-dot washi tape across the middle of the card. 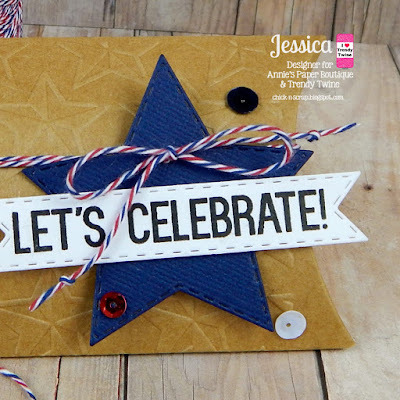 I then took a long length of the fabulous Stars and Stripes Trendy Twine and wrapped it around the card front several times for visual interest and texture. I used a scallop and square die to serve as a mat for my focal image and added it to the upper right portion of the card. Lastly, I added a few sequins and the Congrats sentiment in the lower right corner to complete my card. Thank you for stopping by today. For additional product information please stop by my blog: Creating Somewhere Under The Sun. A 4th Of July Treat! It's Millie, from Crafting with Creative M, and its my day to post! Today's project will feature this month's spotlight, which is the Stars & Stripes Trendy Twine along with the Large Kraft Pillow Box. Since the 4th of July is right around the corner I decided to made a fun treat. I wrapped navy cardstock around the Large Kraft Pillow Box. With my Cricut Explore and the Graphically Speaking cartridge I was able to make the red borders with stars, which I adhered on both sides of the navy cardstock. 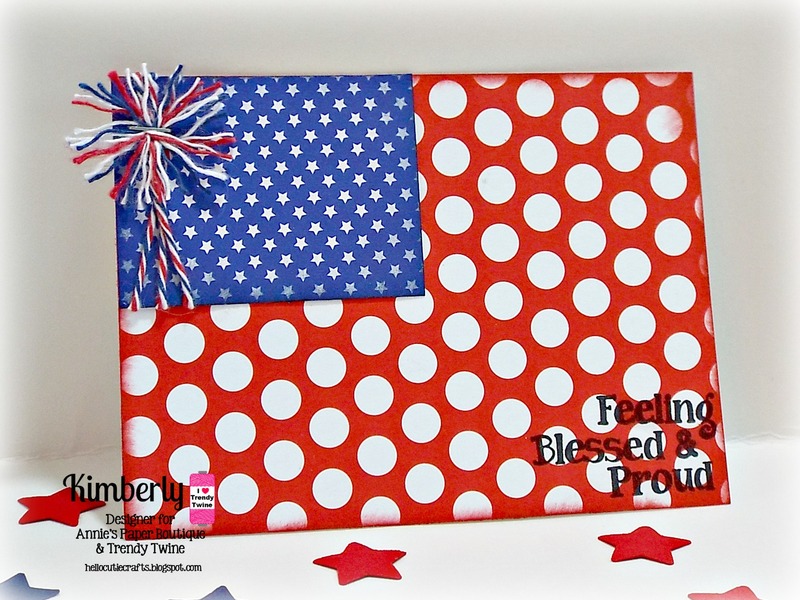 I then placed a strip of the Stars & Stripes Trendy Twine on each side of my borders as well as small bows on the bottom portion of the Large Kraft Pillow Box. 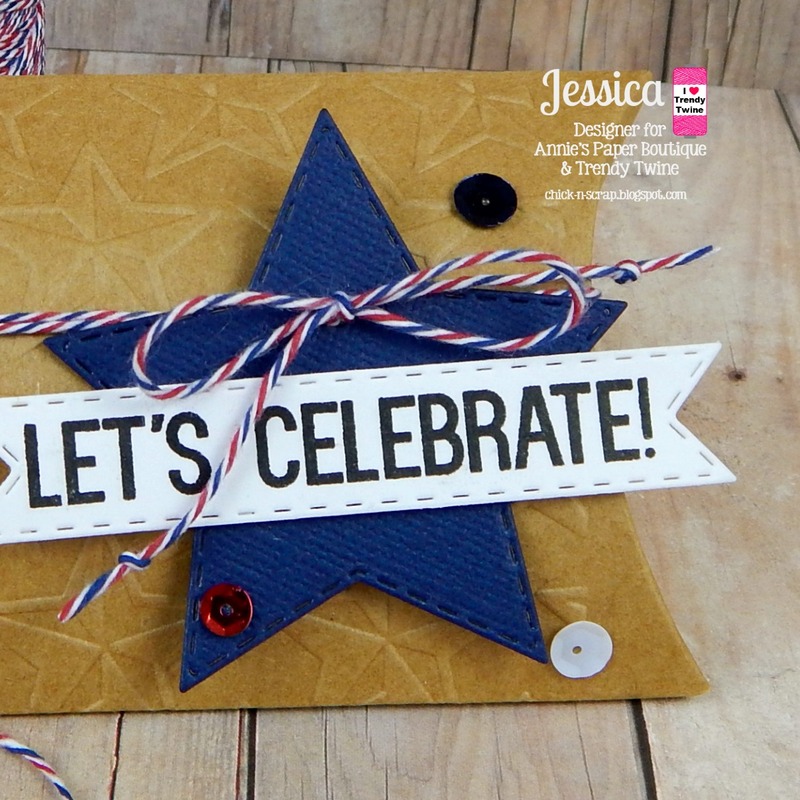 I used the CAC2 cartridge for my banner and made pom poms for each side with the Stars & Stripes Trendy Twine. For the 4th of July doggie and his super cute outfit I used the CAC2. I stamped the sentiment "Celebrate" from Teeny Tag Greetings by My Creative Time on the banner, which I made with the "When I was a Kid" cartridge. Since I am invited to a 4th of July BBQ, I will be making a few of these fun treats and filling them with red & blue gumballs. Fun & Yum! Thank you for stopping by and have a fabulous day! Kimberly from Kimberly's Crafty Spot. 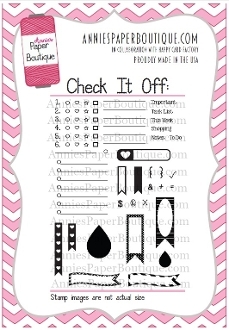 using Annie's Paper Boutique Planner stamps. along with some Stars and Stripes Trendy Twine. These cards will be added to our July Project Life pages. For the rest of the details of my project, please visit my blog. Happy Sunday! It's Trendy Gal Melissa here from M Miranda Creations and I have another geat gift idea for you today as we spotlight the Stars and Stripes Trendy Twine and the Kraft Pillow Boxes this month. I hope you have been keeping up with all the 4th of July inspiration that the Trendy Gals have been sharing all month long. 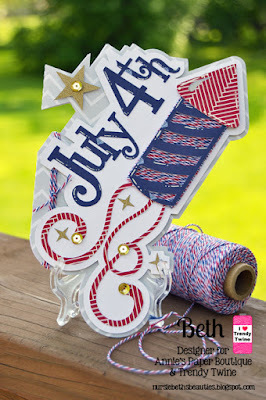 4th of July is such a fin holiday to craft for! For my project, I wanted to make something I could use to thank those who serve. Or it could even be given to a hostess for a 4th of July gathering. I am using the Medium Kraft Pillow Box for this. 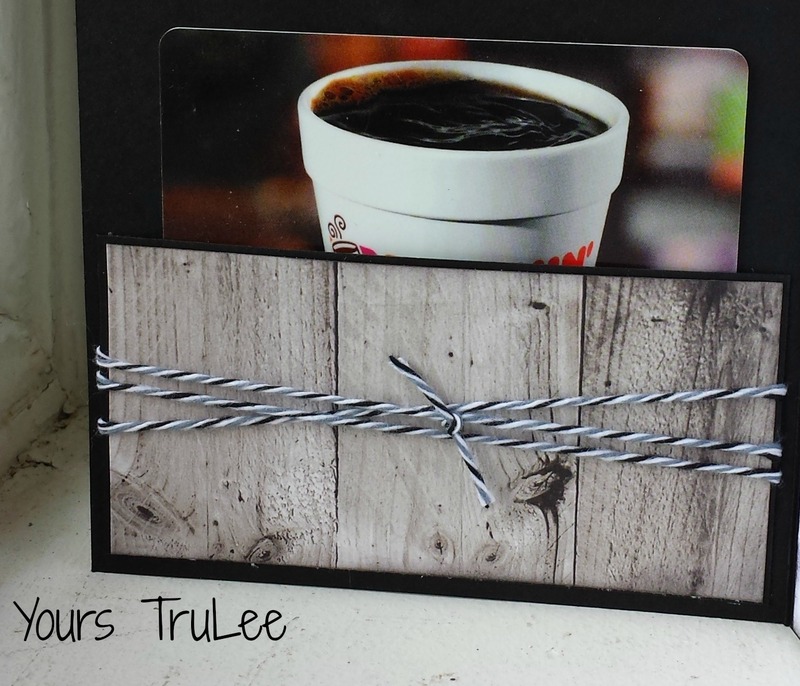 For this card, I wanted the twine to be the focal point, so I did not add my usual paper piecing on top of the patterned paper. 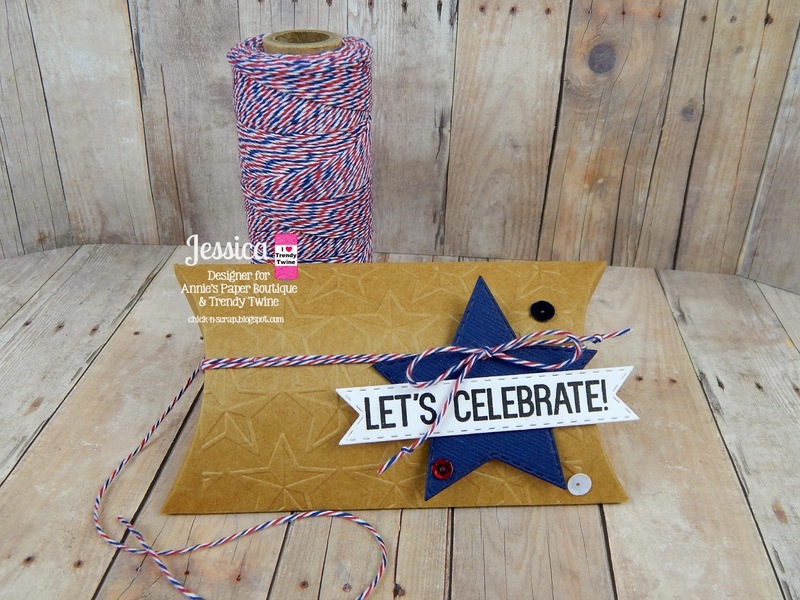 I wanted my Stars and Stripes Twine to pop off the card instead. 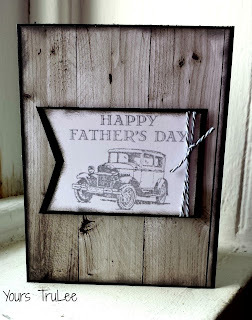 I think the patterned paper and twine will makes it a great guy card which are sometimes so hard to come up with. And then the Medium Kraft Pillow Box is perfect for stuffing in a treat or a gift card. And it looks awesome wrapped with more of the twine and the added stars. It will make a wonderful gift set for anyone this 4th of July as we celebrate freedom, but especially to say thank you to those who serve. Thank you for stopping by today. We hope you will stop by the store and see all the great products Lesley has for your 4th of July crafty needs. And please stop by the FB group page, Twine It Up, and share all your wonderful creations with us. And if you want a few more details on my gift set, please stop by my blog. Hello friends! This is Tammy and I am featuring the Medium Kraft Pillow Box and Stars and Stripes Trendy Twine. 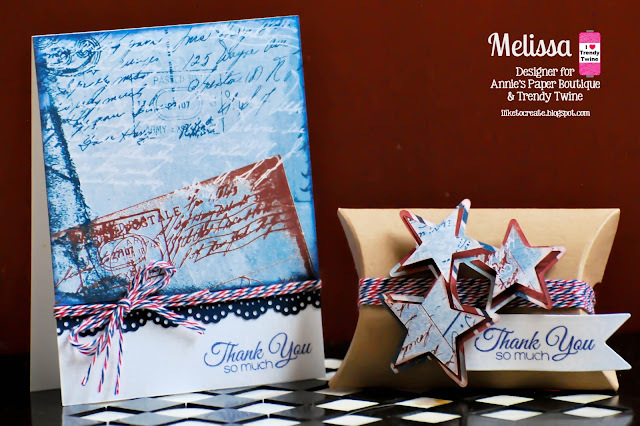 As you have been seeing all the aweosme projects this month, the twine is a fabulous mix, of red, white, and blue. For my project, I started by stamping a cute border in Navy Blue ink along the top and bottom curves of the pillow box. I added a die-cut border of stars to the center. At the top and bottom of the border, I wrapped the box several times with the Stars and Stripes Trendy Twine. I added a label I created using spellbinders and stamps to the center. 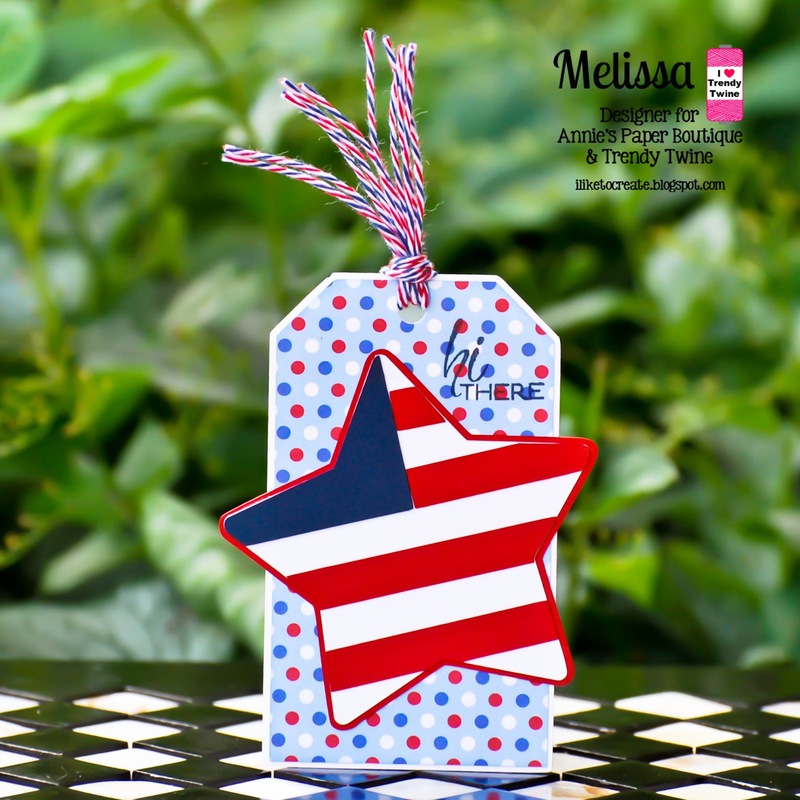 I added sequins throughout the project adding a Stars and Stripes Trendy Twine bow to the center of the label. Lastly, I added a red seam binding bow to the top which was further embellished with a navy button tied off with Stars and Stripes Trendy Twine bow. Hello! 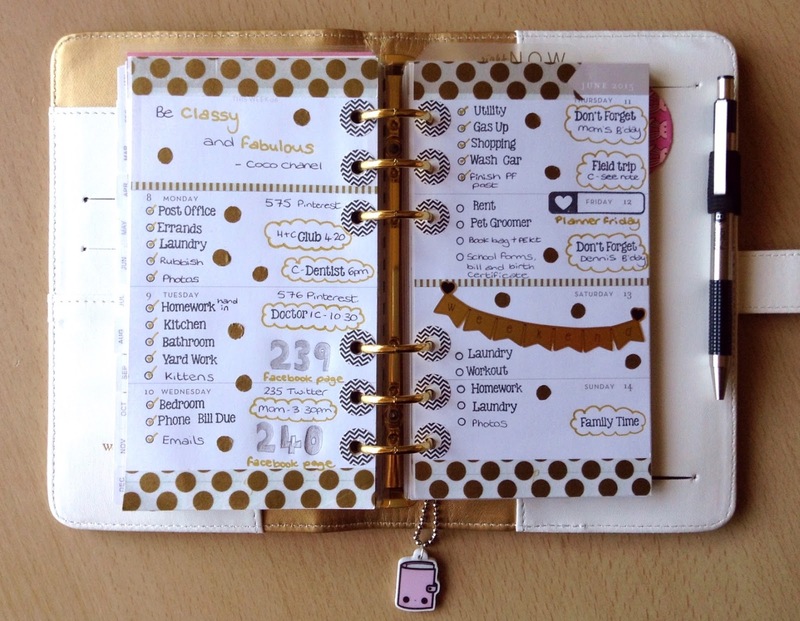 Planner Friday is officially one year old so I wanted to do a special theme for my pages to celebrate. I decided gold and black was the way to go, it puts me in the mind of a classy cocktail party and I think it looks quite sophisticated. I received the newest set of stamps from Annies Paper Boutique this month. It is called the Get It Done set and it has some great stamps in it to help you get organised! You can see all of the stamps in the set in the photo above but my favourite one is the post it note image. It has been designed to fit 3x3 inch post it notes or you could just use it to stamp onto notepaper as a way of highlighting your reminder or notes. There is also a selection of stamps that fit in the top box of the post it note so you can pick the one that works best for you. You can choose from ten different ones, from Goals and Shop to Urgent and This Week. I used the Don't Forget stamp for my list of things I needed to pack and sort out for my daughter's trip to London yesterday. I stuck the post it note on my page marker so I could see it every time I opened my planner. I think it looks so much nicer than if I had written on a plain post it and it makes it stand out more so my eye was drawn to it straight away reminding me to get it done. I hope you have enjoyed this Planner Friday! I will be back with some more ideas for you next month, in the mean time why don't you stop by the store and see if anything takes your fancy?